I have a Halloween dinner coming up this week and the colour theme is orange and black. 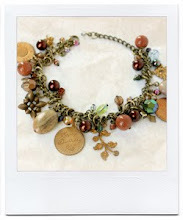 Not very creative there but then it depends on what you do with it. 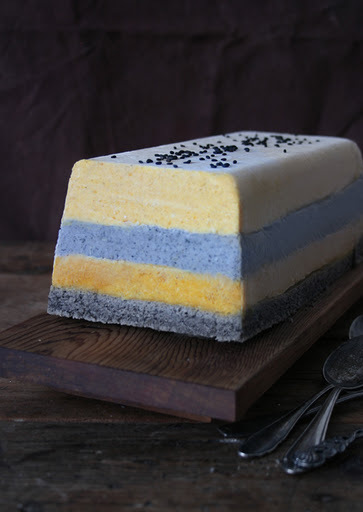 For dessert I was thinking of pumpkin and black sesame so I created this layered ice cream cake on a black sesame and olive oil sponge base. 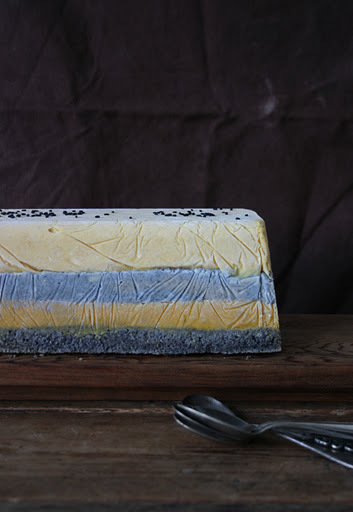 There is another ice cream layer with black sesame and two layers of spiced pumpkin ice cream. You could make double the quantity of my recipe so you get two evenly coloured pumpkin ice cream layers but my ice cream maker is small so I had to do two batches and they turned out slightly different in colour and ever so slightly in flavour. I used a different coconut milk with less coconut content for one and that may have caused it. Oh, and before I forget it, the ice cream is dairy free. Might come in handy if like me you have a friend who is lactose intolerant. Preheat the oven to 175°C. Beat the eggs and 3 tbsp of sugar until aerated and fluffy. In a pestle and mortar grind the remaining 3 tbsp of sugar and the black sesame seeds. Add to the egg mixture. Sift in the flour and baking powder and fold in gently without loosing too much air. Add water and olive oil and pour into a small baking tray and bake for about 10-12 minutes. Cool on a cooling rack. Peel the pumpkin and roast the slices in the oven for about 40 minutes at 175°C. Keep them covered with foil so they don't brown but get soft. When cooled down blend the pumpkin with the ginger, orange peel and spices to a fine puree. Add the spices, caster sugar and coconut milk. Pour in an ice cream machine and make according to instructions. Divide up in two portions for the two layers. In a pestle and mortar grind the sesame seeds to a fine powder. Mix the ingredients and pour in the ice cream machine and make according to instructions. Line a cake tin with cling film and spread half of the pumpkin ice to create the first layer. Put in the freezer to set. 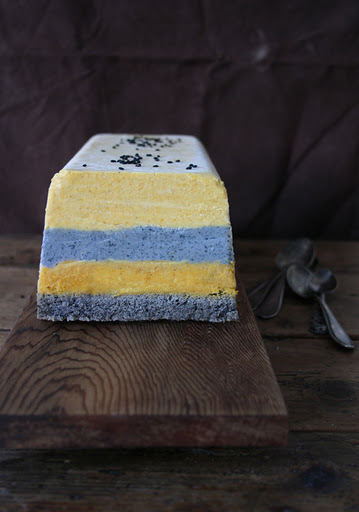 Now add the black sesame ice cream and place in the freezer again before spreading the second layer of pumpkin ice cream. Cut the sponge to fit and cover the ice cream with it. Pop back in the freezer. Take out ten minutes before serving. Take out of the tin and remove the cling film. Cut into slices and serve. Happy Halloween! 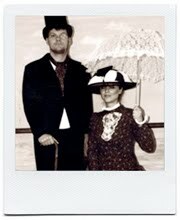 You take such lovely photos and have great ideas. Thank you.